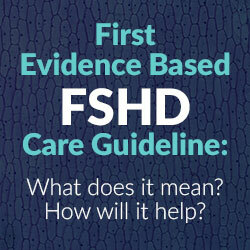 First Evidence Based FSHD Care Guideline: What does it mean? How will it help? Facioscapulohumeral muscular dystrophy (FSHD) is a rare and incurable form of muscular dystrophy causing a progressive loss of skeletal muscle across facial, back and upper arm muscles. FSHD affects 870,000 people worldwide, however, this number could be significantly higher due to undiagnosed cases. This is one of the biggest issues that people with FSHD often face – their case goes undiagnosed for years and thus are not provided with the proper treatment and support. Too often, FSHD patients encounter doctors whose knowledge of the disease seems to be pulled from dated textbooks. Most doctors have rarely, if ever, seen an FSHD patient and they are not equipped with up-to-date information on the symptoms and adequate forms of treatment to be able to properly help and guide a patient with FSHD. On July 27, 2015, the American Academy of Neurology (AAN) published the first evidence based FSHD care guideline. The guideline condenses the results of nearly 60 peer-reviewed studies into a set of recommendations that doctors can easily follow to evaluate, diagnose and treat people with FSHD. This is a major milestone for FSHD research as it represents a foundation to standardize and improve care. The guideline helps educate and answer questions about what FSHD is, what causes the disease, how it is diagnosed, common and uncommon symptoms, genetics, when genetic testing is recommended, predicting the severity of the disease, how it can be treated and managed and several other issues. It makes prioritized recommendations on monitoring complications caused by muscle weakness, breathing, cardiac, eye disease, hearing loss and pain. The guideline also provides a flow-chart and an algorithm for diagnosis, both clinical and genetic. This guideline comes as a result of the FSH Society’s advocacy efforts in Washington, D.C. over the past 20 years. The Society played a major role in the writing and passage of the Muscular Dystrophy Community Assistance Research and Education Act (MD CARE Act 2001, 2008 and 2014), which mandated the U.S. Centers for Disease Control to increase its efforts on adult muscular dystrophy and now specifically FSHD. Due to the work of the FSH Society, the CDC, NIH, AAN, and AANEM now recognizes the need for patients to receive a diagnosis and a standard of treatment and management of their disease. Great strides have been made in FSHD research over the last 25 years, yet there is still so much to be done. The guideline includes some gaps due to the lack of publications in certain areas such as, bracing and orthotics, the benefit of swimming and hydrotherapy, the prevalence of FSHD and the number of non-manifesting carriers. Tighter integration between the genetics of the disease (genotype) and the manifestation of the disease (phenotype). Treatment in the clinic space, as well as, therapeutic treatment will relate to an FSHD patient’s personal genetic/epigenetic genotype and corresponding phenotype. I think I can speak for the whole FSHD community when I say that we are beyond excited and proud to see this guideline. We are proud that we have reached this point and we are excited to see what will come next. This guideline is a stepping stone for other treatments and findings to be discovered and will transform the way FSHD patients are diagnosed, treated and cared for. Reference: “Evidence-based Guideline: Evaluation, Diagnosis, and Management of Facioscapulohumeral Muscular Dystrophy,” a report of the Guideline Development, Dissemination, and Implementation Subcommittee of the American Academy of Neurology and the Practice Issues Review Panel of the American Association of Neuromuscular & Electrodiagnostic Medicine. Download full text (pdf).